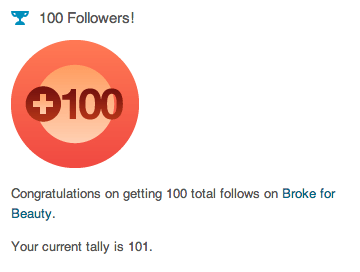 I’ve still been having a hard time health-wise right now, but I was ecstatic to log in and see that I have 100 followers! I want to thank all of you for taking the time to read my blog, even when I’ve been posting much more sparingly than I’ve hoped. Your thoughtful comments and kind words are definitely helping me through as I get back into blogging! Woohoo! Look out for some reviews coming up–I’ve been trying out some new products lately. Check out my Instagram for a sneak peek…and let me know what you’d like to see first! Thank you for being one of them! It’s definitely an amazing feeling, and I can’t wait until I’m feeling better and can post everything I’m behind on. Congratulations! 🙂 Here’s to the next 100 followers. Hope you are feeling better.